How hot should it have really been over the last 5 years? Fig. 1. Seasonal average global temperature anomaly (TA), normalised sign-inverted southern oscillation index (SOI) and normalised total solar irradiance (TSI), from 1979 to 2008. Last year, 2008, was about the 9th hottest year in the instrumental record (range: 7th to 10th). It certainly wasn’t the hottest year. That record goes to either 1998 or 2005, depending on which temperature record you look at. NASA’s GISTEMP gives it (slightly) to 2005, whilst the Hadley Centre and the two satellite measures (UAH and RSS) give it to 1998. Note that only GISTEMP averages over the northern polar regions, an area which has warmed more than the planet as a whole due to the retreat of snow and ice (which makes that part of the world duller, and so able to absorb more sunlight). A question that is often asked by the naive or disingenuous is: “If the buildup of greenhouse gases is causing global warming, then why isn’t each year hotter than the previous?” This is a simplification the more common meme: “Global warming has stopped since 1998” (I note that it ceased being “Earth hasn’t warmed in the last 10 years” when 1998 passed more than a decade into history). The latter question is addressed explicitly in this earlier post — it has to do with the amount of energy transferred from the oceans to the atmosphere, given that most (>95%, on average) of the extra energy being trapped by increased greenhouse gases in going into slowly heating the oceans and melting ice across the planet. Climate scientists obviously recognise that the Earth’s temperate is influenced by a whole range of forcings and feedbacks. Greenhouse gases, predominantly CO2, is one forcing causing gradual, inexorable warming. Transfer of heat from the oceans to the atmosphere is another and can cause temporary warming or cooling — perhaps the most important being characterised by the El Niño / La Niña oscillation. The solar cycle, lasting an average of 11 years, is yet another. A fourth powerful but occasional influence is large volcanic eruptions which cause temporary dimming (cooling). Global climate models include all of these factors when attempting to reconstruct past temperatures, and can be used to make future predictions of climate if these forcings are specified for future scenarios. But we don’t need a global climate model to get a rough appreciation of how these forcings affect year-to-year temperature. We can approximate them with some basic correlative analysis that are uncomplicated and straightforward to understand. Fig. 1 shows three relevant time series. In green is the seasonal average global temperature anomaly (TA), based on the composite measure provided at WoodforTrees. This is useful as it side-steps the ‘debate’ over which of the four major temperature measures is ‘best’ – it uses all of them and corrects for different baselines. Seasons are Dec-Jan-Feb, Mar-Apr-May, Jun-Jul-Aug and Sep-Oct-Nov. In blue is the southern oscillation index (SOI), in this case inverted (so that a higher SOI generally equates with a positive forcing) and normalised to scale between 0 – 1. In red is the satellite measure of total solar irradiance (TSI; similar to sunspot number), originally reported in watts per metre squared but here also normalised to a 0-1 scale so that it can be plotted alongside temperature and the SOI. The SOI and TSI have been offset by 3 months compared to Temperature, because we would expect some lag between the forcing and the response. The period 1979 to 2009 is chosen for two reasons — it is the period covered by all four temperature measures, and it also represents a span of time sufficient to represent ‘climate’ rather than weather — 30 years. Fig. 2. Actual temperature (green), predicted temperature (blue, based on greenhouse gases, SOI, TSI and volcanic forcing) and temperature trend (grey dashed) with SOI, TSI and volcanic forcing held at its 30-year average. Visually, it is clear that there is quite a good relationship between the up and down fluctuations of temperature and both SOI and TSI, although the gradual upwards trend in temperature is also apparent. We can quantify this relationship statistically. I fitted a simple linear ANCOVA model with TA as the dependent variable and Time (each season since DJF of 1978-1979), SOI and TSI as continuous predictors and volcanic forcing as a categorical predictor (VOL; a value of 1 is assigned for the few seasons following the 1982 eruption of El Chichon and the 1991 eruption of Pinatubo). I’ve ignored other complicating matters such as tropospheric aerosols. Still, the model is structurally not too bad a fit (for those familiar with the method, the residual model diagnostics confirm a reasonable conformation with assumptions, and 67% of the deviance is explained by the four predictors). These results are useful. They show a strong positive trend in temperature (+0.0054C per season [or about 0.216C per decade]), a forcing of about +0.4C for a strong El Niño, +0.24C for the peak of solar forcing, and -0.27C for a volcanic event. With this model-based information, we can make two visual additions to the temperature plot. They are show in Fig. 2. 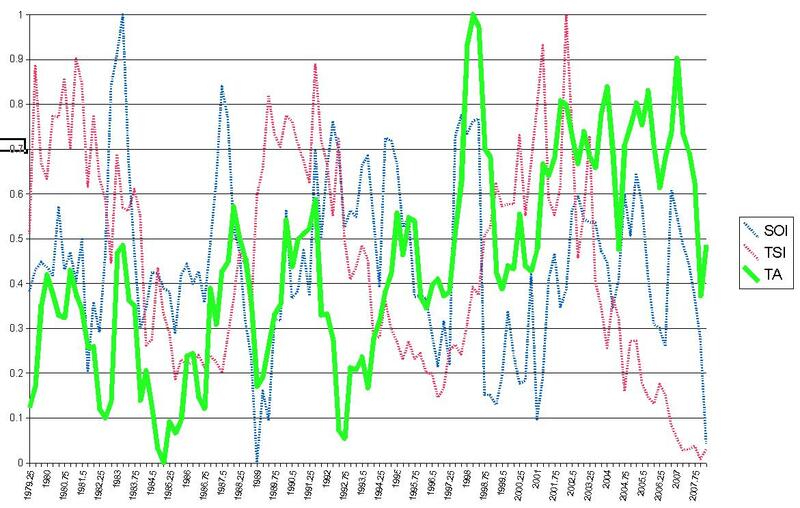 First, the original temperature data is plotted in green. In blue is the season temperature as predicted by the ANCOVA model, based on historical forcings. The dashed trendline is the warming trend expected if all other forcings (SOI, TSI and VOL) are held at their 30-year average values. Of relevance to the title of this post, these correlations can be used to work out (crudely!) what temperatures we might have expected over the last five years based on three different scenarios. First, if SOI, TSI and VOL were all held at their 30-year average, what would the global temperatures have been in 2004, 2005, 2006, 2007 and 2007? (AvF) Also, what if they all been at their minimum (MinF) or maximum (MaxF) 30-year values? These scenario results, along with the composite observed temperature anomalies, is shown in the table below. The last three columns represent deviations from the observed values (so, for example, in 2006 the observed anomaly was +0.69C but if all forcings had been at their 30-year average [AvF] it would have been +0.03C hotter than this, or +0.72C). These numbers indicate that 2004 and 2007 were right on the average forcing expectation . 2005 was slightly hotter than we’d have expected (it was an moderate El Niño year and near the top of the solar cycle) and almost spot on the MaxF prediction. Conversely 2008 was quite a bit cooler and close to the MinF expectation. Why? It was a La Nina year and the sun had bottomed out in its irradiance/sunspot cycle. If 2008 had been an average year, we should have expected it to be 0.25C hotter, at around +0.75C anomaly. Jim Hansen seems to think that an El Nino this year or next is probable, and nearly certain by 2012. Does that seem right to you, Barry? You will find an excellent discussion of current ENSO conditions on Klaus Wolter’s Multivariate ENSO Index page at NOAA. His analysis suggests continuing (perhaps weak) La Nina conditions through this year. barry would you be able to model future probable average temp if we get a year of solar maximum combined with el nino? i appreciate that you’ll need to add “realms of probability” but i would be interested/prepared for it. notallright #4: Have another look at the last section of this above post — I do this already. Best estimate is that with a moderate El Nino at the next solar maximum in 2013, it will be a +1.2C anomaly, or ~0.4C hotter than 1998/2005. Steve Bloom: Yes, I’ll be floored if we haven’t got another El Nino by 2012. I suspect 2010 is the year but that’s just a hunch. One of the reasons I do not believe you “greeners” is the way you couch questions. You attempt to eliminate descent of any kind simply by labeling anyone who asks a question. The following is a perfect example. It’s a method used by the Nazi and religious fanatics to identify heretics. But it illustrates that Global warming is just your religion. The assumption is that anyone who asks a question, you imply, is either naive or disingenuous, when in fact, it just may be a question. It just proves you really don’t have an argument, you just have to threaten anyone who may have serious questions about your methodologies or conclusions. No problem here with questions, and I don’t see the problem with the “naive or disingenuous” phrase. It is a naive assumption to make in you are not aware of how the climate system operates and the difference between non-trending and trending forcings. The post above dispells that assumption with empirical data. It is disingenuous to continue to claim this after being aware of the above — yet many do. I was wondering if you could show us your predicted temperatures to the year 2100. Andrew Simpson #7, a 2100 mean projection from this model is simply a continuation of the Year component from the model (dashed line in Fig 2), since SOI and TSI are not trending. This implies +2.4C compared to 1980-2000 average. However, this would assume no acceleration in the trend in CO2 forcing or carbon cycle feedbacks, so should be treated as a lower range. Barry @9, ‘SOI is not trending’ – this is a brave assumption, no? Haven’t there been some prognostications that greenhouse forcing will increase El Niño frequency and/or amplitude? Mark, some models suggest El Nino gets more intensive or ‘locked in’, other GCMs suggest it stays quite similar to today, or even weakens. But you’re quite right on the broader point, that trying to project to 2100 on the basis of an ANCOVA model is brave. Indeed, I deliberately didn’t do it in my post — was just responding to a query. By the end of this century, so many other things will have happened that a simple correlative model, extended well beyond its fitting data, will hardly be adequate. Still, I think it’s useful for it’s purpose, which was retrodiction and a short forward-forecast to about 2013. I’m not familiar with that term “meme” but I’ve started to see it a few times. In context it looks like “idea” or “theory” or perhaps even “theme”… can you perhaps take a moment for an explanation? I’m beginning to think it doesn’t mean what I think it means. And urban heat island and land use changes in the northern hemisphere have a major impact largely ignored by climate modelling estimators of CO2 sensitivity. Beware of simplistic nonsense. Our climate is far from simple. 1979 is when the satellite temperature record began, simple as that. Would you prefer I change history and put those satellites up earlier or later? RE Phelan #13: A meme is explained here – it’s originally a Dawkins term and in this context means “…a neologism used to describe a catchphrase or concept that spreads quickly from person to person via the Internet”. Would you prefer I change history and put those satellites up earlier or later? Remembering also that the impact of increasing atmospheric CO2 is logarithmic and greatest proportionally at lowest concentrations. If you’ve found the stash of missing heat somewhere and found a way to keep cities cooler than swamps, forests and pastures please publish your discoveries and we will all be able to assist in preventing global warming using methods that obviously work. A meme can be interpreted as a lie told often and loudly enough until it becomes truth. An example is the preposterous claim that temperatures recorded during the last 200 years using un-calibrated instruments, in different locations, using different methods of reading and recording data can in any way be considered a ‘climate record’. I haven’t been able to post here for some time as my work takes me into remote locations and I have more pressing texts to read than climate blogs. However, some of the writings Barry has published recently are intriguing and deserve serious contemplation. There are no long term climate records for the area I visited recently but the conditions are well known and many people regularly volunteer to work there – one wears appropriate protective clothing and you are rather forcibly encouraged to monitor the colour of ones urine to ensure you are hydrated enough. The temperatures I experienced there exceed 50C with 100% humidity – it’s horrible but one has a job to do and everyone just hooks in to complete the task. In other counties where such temperatures are common no work is contemplated during the heat of the day – they are poor countries though and prefer the shade of their awnings to commerce. That said whenever I see a post that includes claims of disaster like the open letter to Rudd 747 I just hit the scroll button and whip by. However I’m a convert to the idea of nuclear power – I don’t subscribe to the rather old fashioned alarmist theories that CO2 is the devil incarnate, but I see many advantages in nuclear power. Not withstanding the CO2 argument, the particulate fall out from coal fired power stations is ugly, un-healthy and dangerous to both humans and the rest of our environment. Anyone who travels through the Latrobe valley cannot fail to notice the ‘fallout’ on café tables, car roofs, and washing drying on Hills Hoists in the ‘burbs’’. I’ve sailed aboard nuclear powered warships and traveled across countries that generate the majority of their power using the atom. Nuclear power doesn’t hurt; it’s invisible, doesn’t smell and doesn’t clog your eyes and nasal passages with soot. But the most obvious problem with your analysis is that the SOI (Southern Oscillation Index) is not actually a forcing like CO2, solar irradiance, etc. It’s an ‘abstraction’ based on temperature measurements of a part of the climate system over a specified period of time. If you’re trying to correlate the SOI with lower or warmer temperature… I mean of course it will… what do you expect? You can’t use the SOI as an *explanation* for global cooling (whether long or short term) because it is essentially a *climate measurement*. All you’re really saying is that cooling is a result of part of the climate causing the climate to cool. Or more simply, a cooling climate is causing the climate to cool. Which is of course circular. Yes, solar irradiance is a factor, and nobody reasonable (whether an AGW promoter or a sceptic) denies that, so you are not stating anything out of the ordinary with this point either. So in summary I think you’re still left with the problem of suggesting that the cooling climate is a product of a forcing (irradiance) and ‘natural climate variability’. This won’t make the sceptics happy because if you’re ultimately falling back on ‘natural climate variability’ to explain decadal cooling, then they are going to point out that the same argument can be used to explain warming over decadal time scales as well. Why is CO2 needed? Now, I do want to point out that I do believe CO2 should have a plausible effect on the climate system over time. I’m just pointing out why your above analysis has some fairly serious logical flaws and doesn’t solve the problem you’re trying to make it solve. Yes, the relationship between CO2 forcing and temperature change is logarithmic. Roughly 3C for fast forcing for a doubling of CO2. What does that mean? It means that going from 50 parts per million (ppm) to 100 ppm will yield 3C warming. As will going from 150 to 300 ppm. Pre-industrial was 280 ppm, so a doubling to 560 ppm will be about 3C warming (+ slow feedbacks giving another 3C over centuries). Once we get to 560ppm, we’d have to increase to 1120 ppm to get the same effect (another 3C). So you are quite correct that the effect diminishes. Just not slowly enough to avoid catastrophic problems associated with 3C+ over the next century. UHI is corrected for in temperature metrics. Rural stations and sea surface temperature (UHI absent from both, obviously) show the same warming trend (close to identical) as corrected UHI stations, showing that the correction works. You are right, SOI is an abstraction – technically, a partial composite [and emergent property] of a bunch of forcings and feedbacks, including ocean heat content and overturning, and lags in solar forcing. The analysis above is not circular, it is simply correlative. It is using SOI to explain residual variation in temperature fluctuations, assuming that SOI retains some signal of mechanisms that do force climate and result in feedbacks. SOI is used as an independent variable, not a dependent variable. So no attempt is made in the above model to predict what SOI will be in the future. If you’re trying to correlate the SOI with lower or warmer temperature… I mean of course it will… what do you expect? Quite. That was indeed my expectation. My interest was not whether this relationship existed, it was in the value of the partial regression coefficient for SOI when TSI and trend were also included – the analysis yielded a value of +0.4C between a deep La Nina and a strong El Nino. This is interesting and useful, as I showed at the bottom of my post. So there are not logical flaws in the above. Merely a difference in expectations as to what the analysis is trying to achieve. If I used a mechanistic rather than statistical model, SOI would not be a parameterised component. There would instead be physics-based models for ocean overturning and heat exchange, atmosphere-ocean interactions, etc. That is, a global climate model. The above can be thought of as cartoon version of a GCM, since so many complicating details are implicitly captured rather than explicitly modelled. Now GCMs still do this for features below their level of spatial resolution, such as cloud formation. As statistician George Box said, “Remember that all models are wrong; the practical question is how wrong do they have to be to not be useful.”. I wouldn’t disagree with anything you’ve written. On the other hand we’ll have to agree to disagree on whether you think what you’ve done here isn’t a circular form of reasoning. That is, using pressure differentials driven by temperature changes to attempt to explain temperature changes… I’d say you’d need to pull the abstractions out of your analysis and deal with the actual forcings as they are currently understood. Not sure if I’m asking too much here. Available measurement data may not be up to the task. UHI is corrected for in temperature metrics. Misses the point. Land use changes impact climate and temperature significantly. “Correcting” the temperature record for UHI doesn’t model reality, it fudges reality to try to match the models. I agree with Will. Basically the available data is totally inadequate in quality, coverage and timespan to validate the climate models given the natural variation, autocorrelation and complex cyclic behaviour of our climate. The Nature chart you linked to conveniently stops in 2000 since the last decade would have revealed an inconvenient truth – a marked divergence from the models. Again, such selectivity is not calculated to inspire trust. The satellite records do not suffer from UHI, with or without correction. The above analysis includes the satellite record. Sea surface temperatures and rural stations are also included in the above analysis. Neither include the UHI. Since there has been no decline in temperatures since the year 2000, it is irrelevant whether the linked figure stops in 2000 or 2008. The ‘gap’ of where natural forcing should have taken us, and where natural+anthropogenic forcing has taken us, remains at about 0.6C. ok so the fact that surface temperatures have levelled out globally for a decade or so does not mean gw has stopped, because the heat could have ‘sunk’ into the oceans. But why didn’t it sink into oceans before? What suddenly changed a decade ago? The point here is relatively how much heat is released back into the air. We had a whole heap in 1998, and a lot in 2005, and relatively little in 2008. That ocean-atmosphere exchange of heat is an important determinant of short-term air temperature fluctuations. Heat may well have been sinking into the oceans before, but this must then have happened at a lower rate than now, which would explain why the mostly steady surface warming of the last 100+ years, stopped 10+ years ago. So my reworked question is : do we have any idea why it started sinking into the oceans a different (higher) rate? And is the decade-long *levelling off* of surface temperatures, correlated with *increased* warming of the oceans for that period? The SOI/el nino event is indeed a ” non trending ” force, being, like the rest of the atmosphere ocean interactions, esentially a chaotic outcome borne of chaotic causes. A manifestation of natural variability. No one knows why there are seasonal failures of the southerlies off Chile that fail to turn over the Humboldt current, setting up the pressure gradients characteristic of el nino. Even it they did, they would need to find out what caused that, and so on, ad infinitum. The same applies to the PDO.The fact that these, and other manifestations of natural variability, cannot be currently predicted, either in terms of time or scale, makes for little confidence in models that interpret the temperature record as a predictable outcome of ” trending forcings “. Sorry Prof, but you lose me at times. Interesting site tho….and pro nuclear too! And if the decade-long levelling off of surface temperatures *isn’t* correlated with increased warming of the oceans for that period, can we still say gw has occured for that period? BFJ Cricklewood – the oceans and their heat gain, is so large compared to the energy going into changing air temperatures (about 90% oceans, 3% air), that any difference in the fairly steady rise in OHC would in difficult to detect over general system variability. Which means gw itself is difficult to detect over general system variability? In the short term, yes, it is — short-term variability overwhelms the GHG warming trend. Hence the need to look at long-term trends. Look at Fig 2 and see how apparent the trend is over the 30 year period. That’s kind of the point of this post. Glad you got it. Citation: Ummenhofer, C. C., M. H. England, P. C. McIntosh, G. A. Meyers, M. J. Pook, J. S. Risbey, A. S. Gupta, and A. S. Taschetto (2009), What causes southeast Australia’s worst droughts?, Geophys. Res. Lett., 36, L04706, doi:10.1029/2008GL036801. Yes I quite realise the point of looking at long term data for evidence of trends amoungst other variability. * Surface temperatures have leveled out for a decade or so. * This need not mean that GW has stopped, since additional heat could have gone into the oceans instead. * To show that though, we would need to show a correlation between the leveling off of surface temperatures, and an increase in the rate of OHC increases. * But since as you say we cannot (yet?) do this, we therefore also cannot (yet) say that GW has occurred for this period. The general state of play, then, is that though we lack of sufficient data on OHC to be able to rationally say GW has occurred for the last decade, climatologists continue to say it anyway. Well, to be more precise, climatologists say GW has occurred over the last 30+ years, of which the last 5 years is a(n incomplete) part. And you can move the 30 year window backwards in time. Granted, until now a moveable 30-year window shows GW. But now the temperature record for the last 10+ shows no GW. Yet above you refer only to the last 5. Why is that? I ‘corrected’ the last 5 years for ENSO and TSI simply because these were the most recent 5 years — I didn’t want to bother to expand it to include all 30 years. But it would be simple enough to do (if slightly tedious). You can try it yourself if you want — I’ve supplied the coefficients. But the model is fit to 30 years of data (as far back as the satellite record goes), so it’s actually about a 30 year period I’m addressing. (Note to your webmaster: although I am subscribed to this post, I do not get notification emails). This doesn’t really address my question, perhaps I need to restate it more clearly. The most interesting data is the last 10 or so years, interesting because it shows no GW, thereby breaking from previous patterns and current understanding. Why then do you focus on only the last 5? Simply because the last 5 years were the five most recent years — and so were able to be easily summarised in a small table. But the exact same method, as applied to the last 30 years, is also plotted, in figure 2. So I guess I’ve focused on 5 years and 30 years. The last 10 years is within there if you prefer this period — or any other 10 year run. Regarding the last 10 years, as you can see from Fig 2, the match between predicted and observed is excellent for 2002 and 2003, and a little too high for 1999-2001. The prediction for 1998 (11 years ago) is way too low — indeed, it is the most anomalous year for the model predictions of the 30 year series by a long way (perhaps because the regional [low latitude] ENSO forcing was higher than the normalised index would indicate). Solar forcing, ENSO, volcanoes — they all played their part then, too. See Fig 1 & 2. (e.g. 1982 volcano, 1983 super El Nino, 1988 El Nino, 1991 volcano, peak solar cycle in 1979, 1990, 2001 and solar forcing troughs in 1985, 1996, 2008). (b) merely that it doesn’t falsify the models, there being other equally long runs of years where other, larger effects have masked an assumed underlying CO2 effect? If (b), would you maintain this regardless of how long temperatures failed to rise for, or is there some point (20? 50? …? years) after which you would judge the AGW hypothesis to have failed? Cricklewood: I have a model in my head of the planet tilted and spining on its axis while circling the sun. I can predict that, in Australia, it will get colder during the next few months. I can predict this with great certainty and that certainty will not disappear because of a week of hot days. 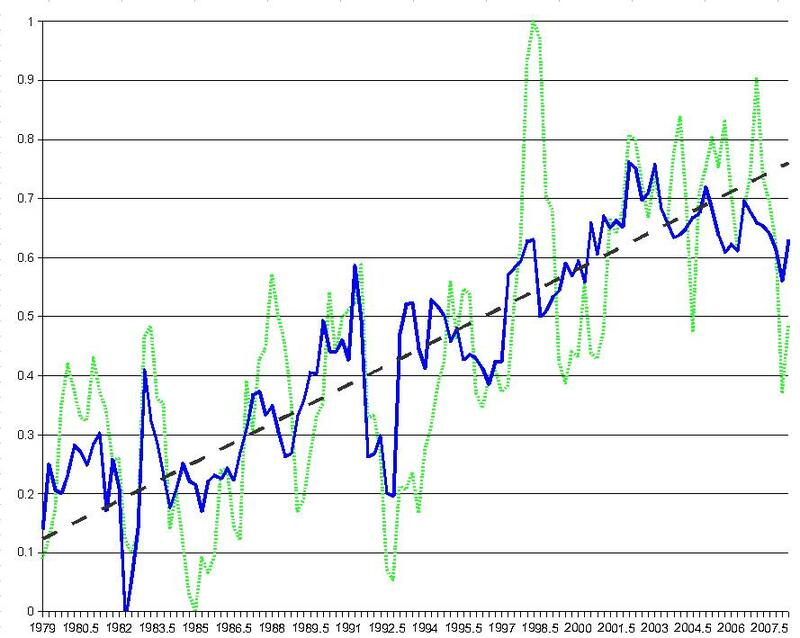 Look at ANY time series of global temperature over long time periods and you can see the cycles as clear as day. Ice followed by warming followed by ice. When you are on your way to a warm period, the odd cold snap doesn’t destroy the pattern. Its just a consequence of the planet being a complex dynamic system. The models do a pretty good job of “predicting” the past based on the raw physics, so they should also predict the future. 10 years is just a blink in the long period of thermal distribution in changes in forcing, just as a week is a blink on the way from summer to winter. That looks to me like the first part of a (b) answer – a 10-year halt in GW is too soon to say GW has stopped. But what about the rest of your answer – ie, are you committed to a GW hypothesis no matter how long GW has halted, or do you have a cutoff point at which would accept the hypothesis is failing? And if so, what is this point? Something fun to consider. Above I predicted the 2009 global temperature anomaly would be +0.75. So far, the D-N figures from NASA GISS have it at +0.71. Not bad, if I do say so myself. Re. Fig 2: Do you know why the difference between predicted and actual temperature is so big in 1998? Is there a link between Adelaide’s heatwave and global warming?